Contacts are at the backbone of any CRM. Your contacts can include your prospects, customers, partners, contractors—any individual that is connected to your business. 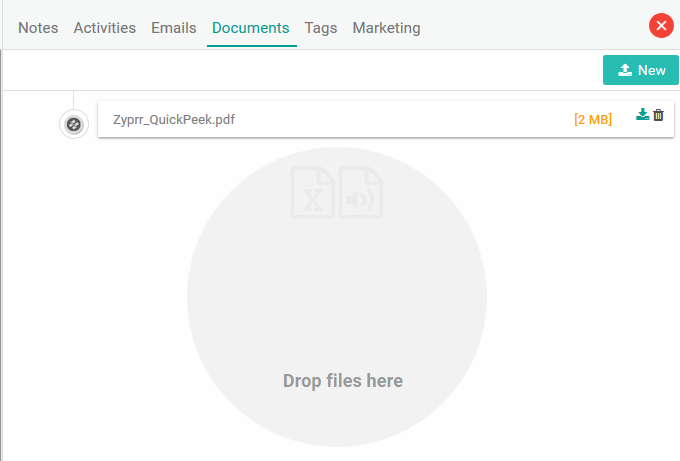 Zipper Agent behind the scene updates the publicly available data of the contacts from various sources, so that your contacts never get stale. In ZipperAgent, Contacts can be added from various places. 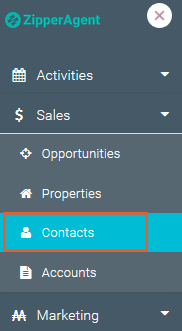 In ZipperAgent you can navigate to the Contact list page from the top Main Menu -> Opportunities -> Contacts or by clicking on hamburger menu then Sales -> Contacts. While on Contact list page, click on button on the right top corner of the page to open the Contact add form. Last Name is the only mandatory field for creating a Contact in ZipperAgent. ZipperAgent has capability to enrich your Contact data by fetching more details of the contact from other publicly available data sources. This is achieved by entering Email Id of the Contact in the Contact Email field. On saving ZipperAgent will try to enhance information for this Contact and you will be able to see more data added on the detail page of the Contact. Take a look at the Current Address block of the newly created Contact, John Doe, in the image below. Although no address information was added while creating the Contact, ZipperAgent’s data enrichment algorithm has fetched this additional information. If available, you may also get image of a Contact auto-loaded upon saving. From any page within ZipperAgent, you can quickly create a Contact by clicking on button on the top navigation aid. 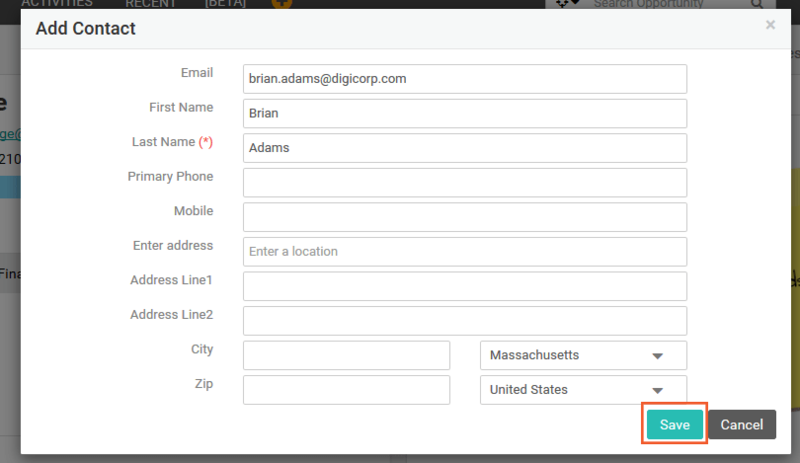 This action will open the Contact Add form and you can add your new Contact by adding all the available information. While on Create Opportunity form, you can either choose an existing Contact to associate with the Opportunity or you may want to create a new Contact by entering some minimal information about the contact as part of create Opportunity process. ZipperAgent with its data enrichment capability will bring in more information for the Contact upon saving. While you are on details page of an Opportunity, you may want to associate Contacts with different roles with the Opportunity. For example, you may want to associate a lawyer with the Opportunity. In these scenarios, you may either choose from the list of existing Contacts in ZipperAgent or you can create a new Contact from the Opportunity details page. 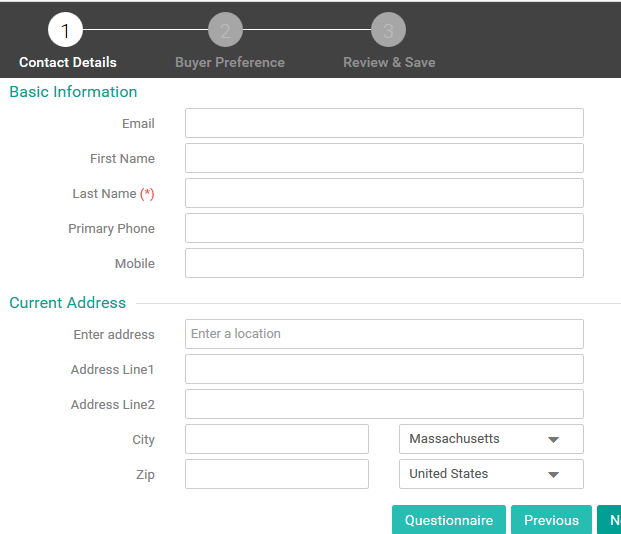 The following images take you through the steps to create a Contact from the Opportunity Detail page. 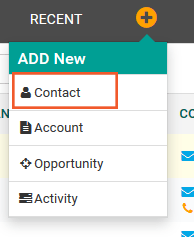 From Opportunity details page, click on the Contacts related tab on the right side. Click on the lookup icon to search a Contact. A list of exiting ZipperAgent Contacts are shown in a dialog. 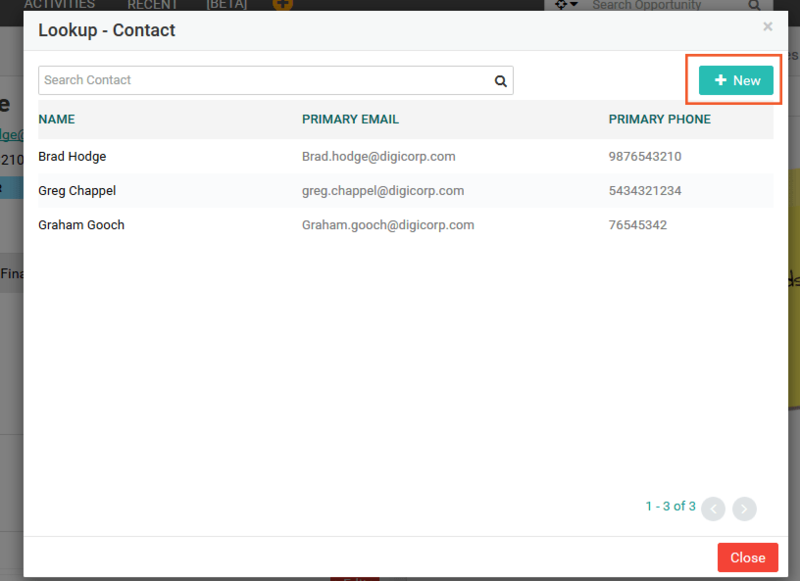 If you do not find the Contact you are looking for, you can click on the New button to create a new Contact. You can see the newly created Contact added as a Lawyer to this Opportunity. You may click on the Contact name and see other details, you can also edit the Contact from the details view. All these actions are allowed while you are in the Opportunity details page. While starting with ZipperAgent or at any later point of time, you may want to upload a list of prospects or customers directly into the ZipperAgent. Post running of marketing campaigns or sometimes through some lead generator tools, you may get Contacts in bulk. These Contacts can be uploaded to ZipperAgent by using the Import utility of ZipperAgent. 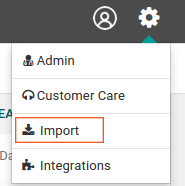 Please refer to help tutorial “How to import” under Getting Started section for further details on the import process. While on the Contact list page, click on Contact Name to open Contact details page. Click more button to view all the Notes, Emails, Activities, Documents, Tags and Marketing related information associated with this Contact. This gives you a 360 degree view of your Contact. Notes: You can add an internal Note for your Contacts. This will give you and your team members an insight on the progress or happenings or important anecdotes of this Contact. Click new button to add a new Note. You can edit or delete a Note after it is created. Activities: All the activities related to a Contact can be seen under the Activities tab. You can schedule a Call or Meeting or create a Task for the Contact by clicking the New button. You can delete an Activity or view details of the Activity by clicking on the Subject of the Activity. To edit an Activity, first click on the subject to view the details and then click on edit button on the detail page. You can quickly change the Status of an Activity by clicking on the smart action icon and then selecting the desired status of the Activity. Click on check icon to save the changed Status. Emails: All Email communications with a Contact are visible from the Emails tab. You can not only view the details of the Emails but also can compose a new Email, Forward or Reply to an Email from the Email tab. Please refer to “Working with Emails” document under Emails section of ZipperAgent tutorials to know more about Email functionality. Documents: Managing all the Documents related to a Contact can we done in ZipperAgent from the Documents tab. You can upload Documents from your local drive or external services. For further details on document management please refer to articles under “Document Management” within ZipperAgent tutorials. Tags: Tags are a quick and flexible way to label and group Contacts. From the Tag tab you can view all the Tags related to this Contact. You can also Tag a Contact from the Tags tab. Marketing: This tab shows all the data related to any Marketing campaign that the contact was included. You can run marketing campaigns through ZipperAgent integrations with ConstantContact and MailChimp. To know more about these integrations please refer to “How to integrate” article under Getting Started section on ZipperAgent tutorials.